Who’s Coming Up on Monday March 19? Meeting the members of the Kamaka ‘Ukulele family was a real treat for the EKK audience. Via a documentary video created three years ago as part of the Craft in America series on PBS, we learned about the four-generation Kamaka Family business which was started by Samuel Kamaka in 1916. In addition to the video, they produced the 100th anniversary two CD album, a compilation of many artists with whom they work, the sales of which goes to support various non-profits. The double K logo used by the company represents the two brothers Fred Sr. and Sam Jr., ages 92 and 95, both are still very active and popular among visitors conducting the tours of the factory during the weekdays. Casey is a fulltime captain pilot with Hawaiian Airlines; he does much of the research and custom orders for the company. Christopher Sr., production manager, handles the quality control of each instrument before it goes out the door. Fred Jr. is the business manager. Many members of the fourth generation work at the shop, including Chris Jr. who was present as a guitar player for tonight’s program. Luthiers Casey and Chris Sr. fielded many questions from the audience following the video. 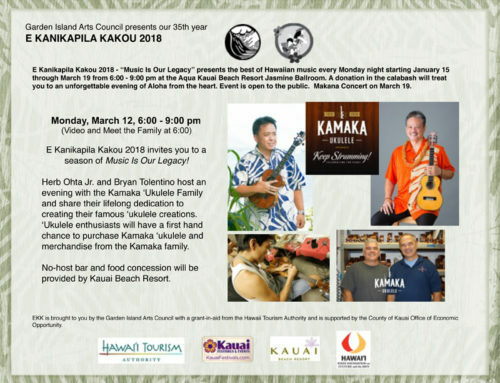 Kamaka Hawaii, Inc., today makes about 3500 ‘ukulele a year, all made to order and distributed by dealers worldwide with the largest market being in Japan because that population embraces everything Hawaiian. The Pineapple ‘Ukulele designed in the mid-twenties by Sam is the Kamaka signature ‘ukulele to this day. Ninety percent of their instruments are made from koa wood from Hawai’i island; koa is increasingly harder to get but care is taken to revitalize the forest by fencing and planting more trees. Mahoghony from Central and South America is easily available; Rosewood is also available but shipping internationally is a major problem, especially when the wood has to go back and forth. They gave pointers on the care of the ‘ukulele and shared that they will repair instruments that got damaged. They also make guitars but the demands for the ‘ukulele keep them too busy. There are 27 full time employees working at Kamaka. Some of the workers were hearing impaired worker suggested for hire by Sam’s wife, an occupational therapist. They were trained to feel the vibrations of the wood. Because their sense of touch was so keen, they were invaluable for this task and some of them had worked for about fifty years at the company. As many of the old timers retired, new and younger workers passionate about their craft have been hired and trained to take over the various steps of producing each instrument. Each instrument is handled by the various workers whose kuleana is one step of the assembly line process, but the workers are cross-trained to insure that every step of the process is covered in making each instrument. Chris Sr., a member of the musical group Ho’okena, said he gave an application form to another member of the group upon his retirement from Pearl Harbor. Today the shop is located in Kaka’ako at 550 South Street and sticks out like a sore thumb among all the new tall buildings, but they are in the process of relocating their shop. Following the video and talk story with Casey and Chris, ‘ukulele players with their instruments had a chance to do a short jam session with the four musicians — Herb Ohta Jr. and BryanTolentino (who just flew in from Japan that morning), Chris Kamaka, Sr., third generation luthier with group Ho’okena on upright bass, and Chris Jr. on guitar. They invited those with ‘ukulele to join in on Noho Paipai with Bryan calling out chords. They then played Ulupalakua w/ Herb as lead vocalist. Following the final 35 years whee-haw!! welcome of the season with the audience members from Kaua’i, Hawai’i, mainland, Alaska, Canada and worldwide, congratulations went out to the 34 perfect attendance participants who received CD gifts with Carol’s weekly wrap. The Kanikapila portion of the program got underway. Herb Jr. shared that he learned ‘ukulele at age 3 from Herb Ohta Sr., his father, his teacher, his mentor, his idol, and quit at age 9 on his father’s advice. But he always kept in the loop with the ‘ukulele because Herb taught his dad’s classes while he went on tours. Ledward Kaapana of the group I Kona was another major influence in his life. Herb shared a song about canoes called Holo Wa’apa by Lena Machado. 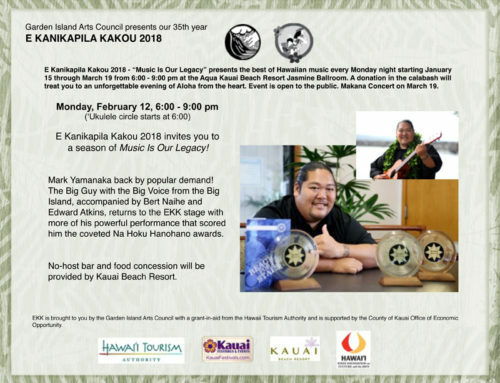 He invited father and son to play together — Christopher Kamaka Sr. and Christopher Kamaka Jr. played Catching A Wave with senior as the vocalist. Junior was encouraged by his Mom to play the timeless Someday, a perfect choice for the EKK audience because it took them back to their youth. There seems to be a lot of light-hearted bantering between Herb and Bryan. Bryan often tells people to “call him HOJ” (Herb Ohta, Jr.) so folks will actually go up and call him “HOJ”, even in Japan. Herb says, “I see you’ve been talking to Bryan.” Bryan talked about a new project between Herb and himself called ‘Ukulele Friends and ‘Ukulele Friends, The Sequel. They played a song titled Leinani w/ Chris on the upright bass. Bryan gave a much overdue intro for Herb, who has recorded seventeen albums to date, pointing out that Herb is one of the cleanest ‘ukulele players who can walk into the studio and is ready to nail everything with no need for warmups. He wanted to showcase Herb’s mastery of the ‘ukulele. This was so important because Herb is overly modest when sharing the stage with others. Herb first shared a hilarious story that happened to him at Hy’s Steakhouse in Waikiki where he often played music for over three hours a night. One evening, an elderly Hawaiian woman walked up to the stage and tugged on his slacks, requesting a song by Iz. Then Herb Jr. treated us to what an ‘ukulele can sound like in the hands of a master ‘ukulele player; he played an exquisitely sensitive version of Somewhere Over the Rainbow. Too bad the woman never heard it. Bryan comes often to Kaua’i. Recently, he was at E Pili Kakou Hula Conference where he met Lady Ipo Kahaunaele-Ferreira. He called on her to join them on stage; she sangNani Kauai in her sultry voice; Poai Galindo came up to dance the hula. Ipo herself was so jazzed at the way she sang the song with the excellent ‘ukulele accompaniment. She shared another song by Teresa Bright who wrote this when she was stuck at Tahiti Nui with nowhere to go because the Hanalei bridge was closed down. It’s about a voluptuous hula dancer who knew three basic steps — uwehe, ami, slide — so that’s what she did; she got up and danced Uwehe, Ami and Slide. Lady Ipo, the Queen of Hawaiian Jazz, delivered that song the way that only she can. The ‘ukulele players went to town with their pa’ani. Chris Sr. sang the ever popular hula song Papalina Lahilahi which brought Lady Ipo, Madeleine Guyett, Polei Palmeira and Mahina Baliaris to the stage to dance. Herb wanted to honor the late Peter Moon with I’ll Remember You, written by the late Kui Lee and sung by Chris Kamaka Sr. Bryan shared many funny stories about “an up and coming young ‘ukulele player and good friend named Jake.” Herb asked Bryan, “Do you think Jake talks about us when he performs?” Bryan shook his head. Eddie Kamae was very influential in the lives of many — his father Herb Ohta Sr., Herb Jr., Bryan and many others were greatly influenced by the man and his music. Bryan shared his story about his last visit with Uncle Eddie. After Palani Vaughan’s funeral, Bryan and Sonny Lim went to visit him at Palolo Valley Hospice. Eddie was dressed in his red palaka shirt. Myrna was giving him ice chips, but he had been unresponsive for a couple of days. Bryan and Sonny spent some time playing music and when it was time to leave, Bryan leaned over to give Eddie a kiss when he was suddenly startled because Eddie opened his eyes, smiled and gave them a shaka sign; he passed away the next morning. The group played E Ku’u Morning Dew composed by Eddie Kamae and Larry Kimura. 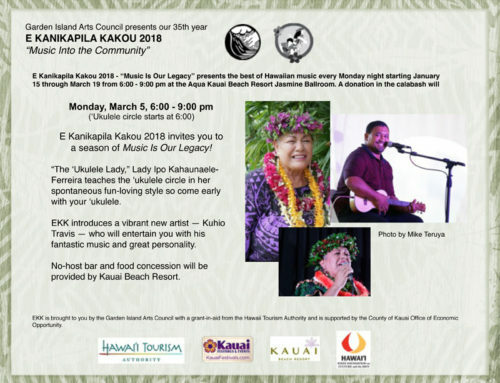 It was a true kanikapila evening with a peek into the history of a remarkable family, great music and stories, impromptu sharing of hula, enjoyed among old and new friends who love and appreciate the Hawaiian culture. 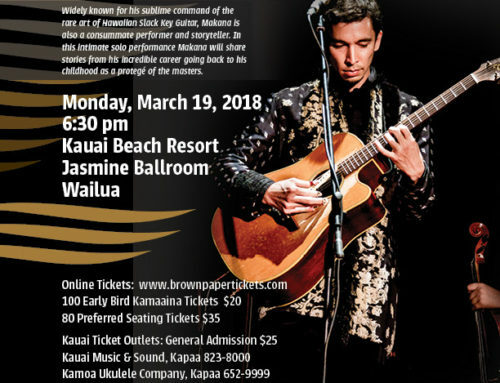 The 35th season will end with a solo concert on Monday, March 19, by the fabulous Makana. Then we bid each other adieu until next January.